Research made relevant through a storytelling approach. This renowned text maintains its acclaimed storytelling approach, teaching the science of psychology through an engaging narrative that makes research relevant to students. Drawing upon their extensive experience as researchers and teachers, Elliot Aronson, Tim Wilson, and Robin Akert present the classic research that has driven the field and introduce cutting-edge research that is the future of social psychology. Significantly updated to reflect advances in the discipline, the 8th edition provides a firm foundation for students to build their understanding of this rigorous science in a way that engages and fascinates. MyPsychLab is an integral part of the Aronson/Wilson/Akert program. Key learning applications include personalized study plans, Social Psychology Video Series, and automatically graded assignments. Personalize Learning — MyPsychLab is online learning. MyPsychLab engages students through personalized learning and helps instructors from course preparation to delivery and assessment. Improve Critical Thinking — The authors emphasize this rigorous science through research examples that encourage students to think twice about their preconceived notions of what social psychology is - and isn’t. Engage Students — Through real-life vignettes, which open each story chapter, and “mini-stories” throughout each chapter, the eighth edition provokes student interest by focusing on real-life examples. Explore Research — The authors present a balance between the latest findings in the field with classic research in social psychology. Noting that some older studies deserve their status as classics and are important cornerstones to the discipline, this text encourages students to experience the continuity and depth of the field versus regarding it as a collection of studies published in the past few years. Support Instructors — This program provides instructors with unbeatable resources, including state-of-the-art PowerPoints embedded with videos, the NEW MyPsychLab with ABC’s What Would You Do videos, an easy to use Instructor’s Manual, a robust test bank, and an online test generator (MyTest). Opening Vignettes introduce real-life examples that illustrate the concepts to come and are referred back to throughout the chapter material. Mini-Stories are woven into each chapter, and are built to illustrate specific concepts while bringing the material to life. Each one pairs a real-life phenomenon that is designed to pique students' interest with an experiment that attempts to explain that phenomenon. MyPsychLab - MyPsychLab is online learning and an integral part of the Marin/Hock program. MyPsychLab engages students through personalized learning and helps instructors with course preparation, content delivery, and assessment. Social Psychology Video Series – The Social Psychology Video Series covers recent social psychological research, science, and applications and utilizes the latest in film and animation technology. Each 4-6 minute video clip has automatically graded assessment questions. Watch clips from ABC's What Would You Do? series and discover how real people in real-world scenarios bring to life classic concepts in social psychology. Pearson eText and Chapter Audio – Like the printed text, students can highlight relevant passages and add notes. The Pearson eText can be accessed through laptops, iPads, and tablets. Download the free Pearson eText app to use on tablets. Students can also listen to their text with the Audio eText. Personalized Study Plan – Students’ personalized plans promote better critical thinking skills. The study plan organizes students’ study needs into sections, such as Remembering, Understanding, Applying, and Analyzing. Assignment Calendar & Gradebook – A drag and drop assignment calendar makes assigning and completing work easy. The automatically graded assessment provides instant feedback and flows into the gradebook, which can be used in the MyLab or exported. Instructor’s eText - Instructors have easy access to videos, readings, and more all in one place within their instructor’s eText. Class Preparation Tool – All of the very best class presentation resources can be found in one convenient destination, so instructors can keep students engaged throughout every class. Blackboard Single Sign-on - MyPsychLab can be used by itself or linked to any course management system. Blackboard single sign-on provides deep linking to all New MyPsychLab resources. Customizable – MyPsychLab is customizable. Instructors choose what students’ course looks like. Homework, applications, and more can easily be turned off and off. Current and cutting edge, the new MyPsychLab Video Series for Social Psychology features videos covering the most recent research, science, and applications. Watch clips from ABC's wildly popular What Would You Do? series and discover how real people in real-world scenarios bring to life classic concepts in social psychology. The authors continue to include the many new major studies, references, and cutting-edge research. These updated research findings keep students apprised of the latest developments in social psychology. Classic studies are examined in detail to ensure student understanding. Older theories are discussed and brought up to date. Instructor’s Resource Manual provides a rich set of resources for each chapter, including an Integrated Teaching Outline with teaching objectives, lecture material, demonstrations and activities, videos, suggested readings, web resources, and information about other supplements. An appendix contains a set of student handouts. Robust PowerPoint Slides provide a framework for lecture outlines with images from the text. For this edition, the slides have been enhanced with even more visual appeal to engage students. The New MyPsychLab contains a wide range of assignable tools that help students understand the concepts covered in the course. With results feeding into a powerful gradebook, the assessment program helps instructors identify student challenges early–and find the best resources with which to help students. New Class Preparation tool collects the very best class presentation resources in one convenient online destination, so instructors can construct personalized, engaging lectures easily and quickly. Create a Custom Text: For enrollments of as low as 25, create your own textbook by combining chapters from best-selling Pearson textbooks and/or reading selections in the sequence you want. To begin building your custom text, visit www.pearsoncustomlibrary.com. You may also work with a dedicated Pearson Custom editor to create your ideal text—publishing your own original content or mixing and matching Pearson content. Contact your Pearson Publisher’s Representative to get started. The printed student study guide is available through Pearson Custom Library. Instructors can create a study guide using only the chapters they teach. Visit www.pearsoncutomlibrary.com to build your study guide. The 8th edition provides a firm foundation for students to build their understanding of this rigorous science in a way that engages and fascinates. In every chapter, the authors ensure their renowned storytelling approach continues to engage today’s students with the most up-to-date examples, case studies, and current research. The new MyPsychLab contains a personalized study plan for each student. Based on Bloom’s Taxonomy, the study plan arranges activities and assessments from those that require less complex thinking–like remembering and understanding–to more complex critical thinking–like applying and analyzing. This layered approach promotes better critical-thinking skills, and helps students succeed in the course and beyond. The Class Preparation Tool collects the very best class presentation resources in one convenient online destination, so instructors can construct personalized, engaging lectures easily and quickly. New Focus Questions in every chapter serve as learning objectives that help students identify key concepts and guide their reading. Updated Try It exercises stimulate critical thinking by encouraging students to take a specific theory or research finding and apply it to their lives. Every chapter contains the most relevant and up-to-date examples and real-life stories, designed to ensure the text continues to engage and captivate today’s students. As always, the eighth edition of Social Psychology provides balanced coverage of the latest findings in the field with classic studies in social psychology. Noting that some older studies deserve their status as cornerstones of the discipline, the authors encourage students to experience the continuity and depth of the field by examining its past, present, and future. 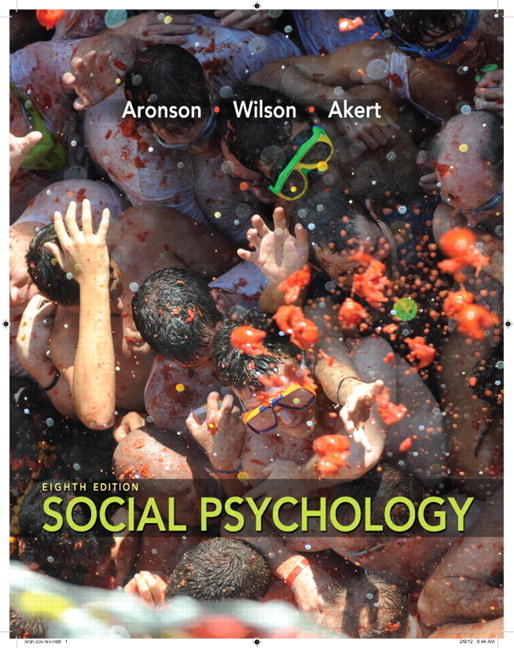 Together, Aronson, Wilson and Akert draw upon their extensive experience as researchers and teachers to significantly update the eighth edition. 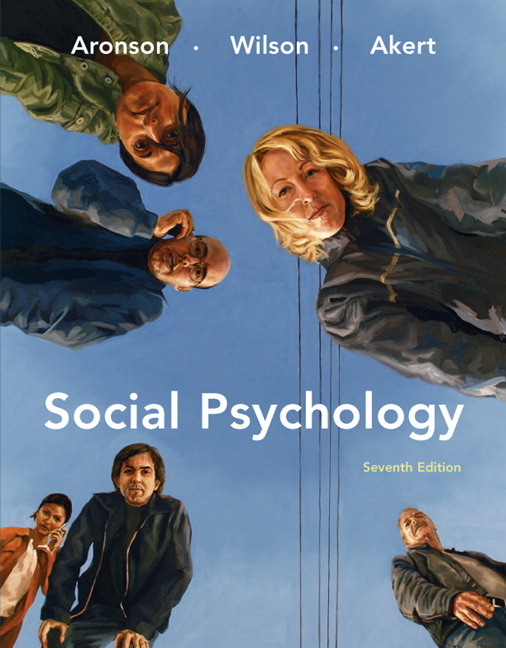 The text includes many new studies and references, and each chapter contains cutting-edge research selected to keep students apprised of the exciting work being done in social psychology today. The New MyPsychLab for Social Psychology contains a wealth of new resources for instructors, including the Class Preparation tool and ABC’s popular What Would You Do videos. Adopters of the eighth edition will receive an updated Instructor’s Resource Manual, a rich test bank with a variety of question types to assess student understanding, and new visual PowerPoints with embedded media. Streamlined outline and organization of topics. Major sections now include “The Theory of Cognitive Dissonance,” encompassing all the facets of CD, and “Self-Justification in Everyday Life,” including hypocrisy, counterattitudinal advocacy, etc. New chapter conclusion featuring an example of a DA who accepted evidence that he had put an innocent man in prison for 20 years. Updated Connections to discuss “hypocrisy induction” as a way of reducing road rage. Recent references to fMRI studies of brains in states of dissonance and the new monkey/bear replication of the Santos study of monkeys and dissonance. Revised material on physical aggressiveness in men vs. women; introduced the term relational aggression; added a study of female suicide bombers. Revised and updated the material on “Violence in the Media,” adding the results of the literature review in Psychological Science in the Public Interest, which concluded that the effects of media violence are strong and meaningful and the meta-analyses of Ferguson and Sherry, which conclude that the effects are low to zero. New sections on the cause-and-effect problem; data on how predisposing factors determine a child’s or adult’s response to media violence; and “putting media violence in perspective,” noting other factors in a youth’s environment that have stronger influences on aggression. Expanded discussion of physiological influences on aggression: adding more on the effects of alcohol (including the “think-drink” effect), Anderson’s work on heat (and predictions about global warming), and a new study of “temper and temperature” in baseball retaliations by pitchers. New contemporary studies and examples of prejudice, including anti-Muslim prejudice, the rise in anti-Mexican prejudice due to economic competition, prejudice against overweight people, prejudice against disabled people, the status of gays and lesbians, etc. Reorganized the three components of prejudice into separate headings; added a second heading, “Emotions: The Affective Component,” to parallel the other two components, Stereotypes and Discrimination. Updated “Stereotypes and gender” to include modern stereotypes of men’s and women’s “natures” and how the stereotype usually does not match actual behavior. Added hostile and benevolent sexism to this section. New “How would you use this?” feature, which asks students to identify any prejudice(s) they have, and see if they can identify its causes.